Naramoto Jinja is a Shintō shrine in the home city of Yukio Seki. On this shrine's grounds are monuments to Yukio Seki and the other four men of the Kamikaze Special Attack Corps Shikishima Squadron, which was led by Seki in the first kamikaze attacks on the Allied fleet on October 25, 1944, in Leyte Gulf in the Philippines. In addition, there are monuments to Battleship Yamato, which sank in a special (suicide) attack while on her way toward Okinawa on April 7, 1945, and Battleship Mikasa, which served as flagship of Admiral Tōgō during the Battle of the Yellow Sea in 1904, and the Battle of Tsushima in 1905 during the Russo-Japanese War. 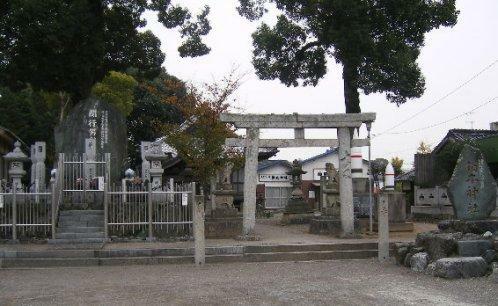 The shrine also has a small Kamikaze (Shinpū) Special Attack Museum. Battleship Yamato led the Japanese Imperial Navy's remaining warships in the final stage of the Greater East Asia War in a tokkō (special attack) sortie on April 7, 1945. West of Tokunoshima Island in Kagoshima Prefecture, the world's largest unsinkable battleship shared the same fate with over 3,000 crewmen after repeated attacks by enemy submarines and air force Grumman fighters. This pedestal's towering shell from Yamato's main guns was a contribution to the spirit of war hero Commander Seki from Yukinao Kōzu of Kure City. On the occasion of this donation, we remember the completion a year ago of the Tokkō (Special Attack) Museum on this shrine grounds with the assistance of Minoru Genda and individuals from all over the country. As we consider this shell as the Greater East Asia War Special Attack Officers and Men War Dead Remembrance Shell and Tower, we hold a memorial service each year on August 15, the day to remember the end of the war, to give the spirits of these men peace and quiet around this shell. On the basis of consensus of Saijō Navy Association members, we launched this project to hold an event to remember and to convey to future generations the officers and men who died in battle for our country's eternal cause. We recall that association members supported various activities since the group's formation on May 27, 1973. At the completion of this monument, we engraved the names of members' units and ships based on naval records to make more of an impression of their service in memory of their youth in those days. This artillery shell was used for the main guns of Battleship Yamato, flagship of the Combined Fleet, during the Greater East Asia War. In those days it was a size without parallel in the world, and perhaps even in the future an artillery shell of such size will not come into this world. With a huge gun to launch this artillery shell, blasting powder to make it fly a long distance, and a control system to have it score a hit, this shell has a shape and material properties that can penetrate an armored deck. The culmination of arms technology attained by the former Navy is displayed in this one artillery shell. This shell, a great national treasure, was offered to the shrine by Yukinao Kōzu, President of Chugoku Kayaku Co., Ltd., through the good offices of Kure Region Commandant Vice Admiral Hideo Katori. As we remember the imposing Japanese Navy in past times, we honor the great deeds of war hero Commander Seki who died for an eternal cause to protect the country of Japan, and we comfort these spirits. The names of 42 members of the Saijō Navy Association along with their units or ships start on the last half of the plaque on the right side of the monument base and continue on another plaque on the base's left side. The Battleship Mikasa Monument is next to the Battleship Yamato Monument at Naramoto Shrine. 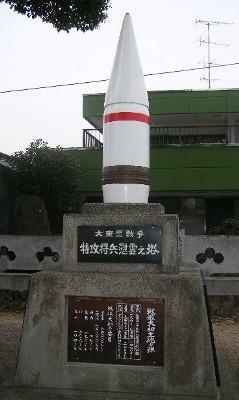 This monument has a style very similar to the Battleship Yamato Monument with an upright artillery shell on a base. Mikasa's shell had a length of 0.95 meters and a weight of 410 kilograms in comparison to 1.95 meters and 1,470 kilograms for Yamato's shell. artillery shell of Battleship Mikasa Monument is further right.